I’ve been meaning to write this post for quite a while to share my new creative journey with you but it’s been hard to find the right words or perhaps the courage. Back in 2004 when I started this blog, it was mostly about sewing. The occasional knitting project also made an appearance but mostly it was about sharing my sewing journey. By then I’d been sewing for quite a few years so while I shared some mishaps and “learning lessons” (ahem! ), I wasn’t posting pictures of crooked seams and such. But polymer clay is new to me. Or rather, I am new to polymer clay. I started working with it last summer, at the end of July. So my work still shows “beginner clumsy” and may not be entirely suitable for public viewing. Consider yourselves warned, hehe. This is the first photographic evidence of my polymer clay work. It’s a bunch of graduated beads in Fimo, which is all that was available locally (and a very meager selection, too). It’s date-stamped August 20, 2015. 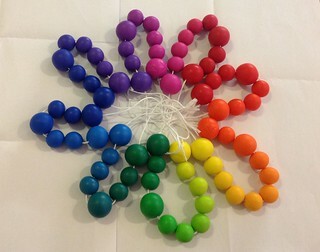 I still have those beads in my memory box. 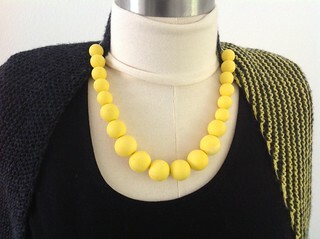 I then switched to Kato polyclay and made a new set of yellow beads, enough for a necklace, two bracelets, and a set of earrings. At the same time that I was making them, I was also working on color beads to get a sense of what colors I could mix from the basic primaries. The colorful tiled rectangles are pivot tiles – they show how the basic colors shift with the addition of neighboring colors on the color wheel, white, gray, and black. 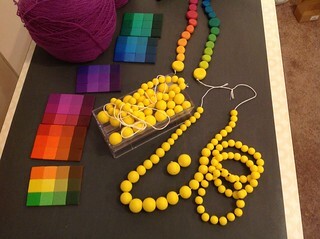 The next part of the color bead project was to go around the color wheel and make gradients between neighboring colors. This is an excellent reference for mixing colors to match or coordinate with fabrics, for example. You’ve seen the above picture before. 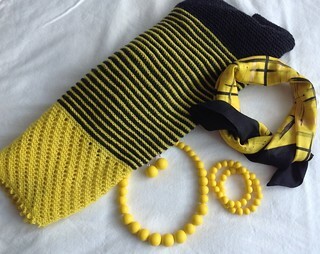 It shows the yellow jewelry set with a shawl I knitted and a silk scarf from my beloved scarf collection. I wore my beads a lot. There’s something about the tactile experience of polymer clay that works for me both in its raw state and even more so when it’s cured. 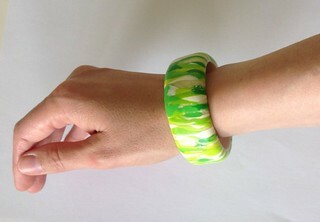 I wanted more polymer jewelry and my next endeavor was a bangle bracelet. Not just one, as you will see, nor was it a straightforward project. In the polymer clay community, when anyone asks about making bangle bracelets, the first suggestion is to use a Coke can as the form. I have skinny wrists. I can put on a bracelet formed on a Coke can and then spend the rest of the day with my fingers splayed O.J. Simpson style to keep it from falling off. Not cool. Also not practical at all. I tried using a Red Bull can but that was too small to go over my knuckles. I’m not easily deterred, hehe, so I then figured out how to make a bracelet in sections that could be strung on elastic. That took a few tries because I was working out not just the process of making it (and keeping the stringing holes open throughout) but also how wide it should be and how to cover the scrap clay base with a pretty veneer. All the shades of mud you see here are scrap clay, not really meant to be seen under normal circumstances. It usually forms the guts of a piece but is covered all the way around with something pretty-colored. The purple bracelet is fairly heavy and large and totally clunky. The bright green one came next. It’s not perfect but it is wearable. It was also the first piece that I sanded – that was a revelation. 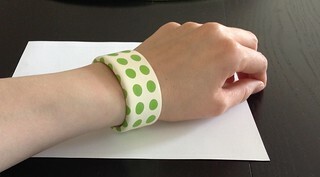 Using this green bracelet, I formed an oval-shaped cylinder to serve as a temporary armature for baking future bracelets. 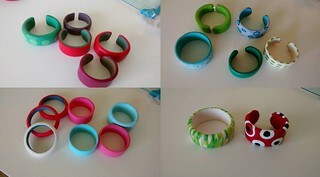 Then I saw some pictures of cuff bracelets. A cuff bracelet is sort of like a bangle bracelet with a cut out section. It doesn’t go all the way around. 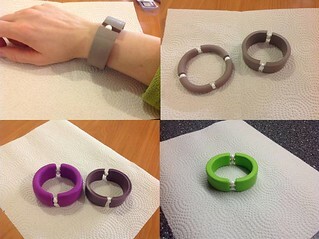 Ideally, it is oval-shaped to fit the wrist just so. The opening helps in putting it on and taking it off but should be small enough that the bracelet doesn’t just come off on its own. I had the perfect baking form for it so I decided to give it a try. I made a few prototypes, again testing different widths and thicknesses, sizes of the opening, and various processes to ensure the visible parts would be as close to flawless as possible. I finally came up with a way to make a cuff bracelet that requires only one curing and the outer layer wraps around the top and bottom edges so the inside structure is never seen while the bracelet is being worn. I even made my own template for it to ensure consistent results. It was great progress and I like wearing the cuffs I made this way. And then one day I finally figured out how to make bangle bracelets in the right size for me. It involved some scraped skin when my first attempt was just a smidge too small and I wasn’t taking no for an answer. Peeps, if you’re trying to put on a bracelet and it just won’t go over your knuckles, don’t force it. Learn from my pain, hehe. Anyway, I now have a whole process for this, from extruding the rounded “snake” and shaping the base on my new temporary armature to the third and final curing, and then sanding the whole piece smooth. All this time I was working on the bracelets, I was also spending a lot of time playing with other things. Pendants and earrings, for example. Figuring out my favorite shapes (circles, thankyouverymuch) and sizes, how to attach jewelry findings, how to finish the backs of the pieces, etc. I was also trying different techniques to find out which ones I like and want to take further. This post is getting awfully long so I’ll wrap it up now and share the rest next time. I would like to hear more about your jewelry making. Thank you, Ruth! I plan to share more about it as I go along. I am sooo impressed, please show us more of your techniques. YES YES – great job. I played around with Fimo…oh, 20ish years ago? I never managed to get any thing that didn’t look like it had been made in a junior high art class. Your bracelets are lovely!